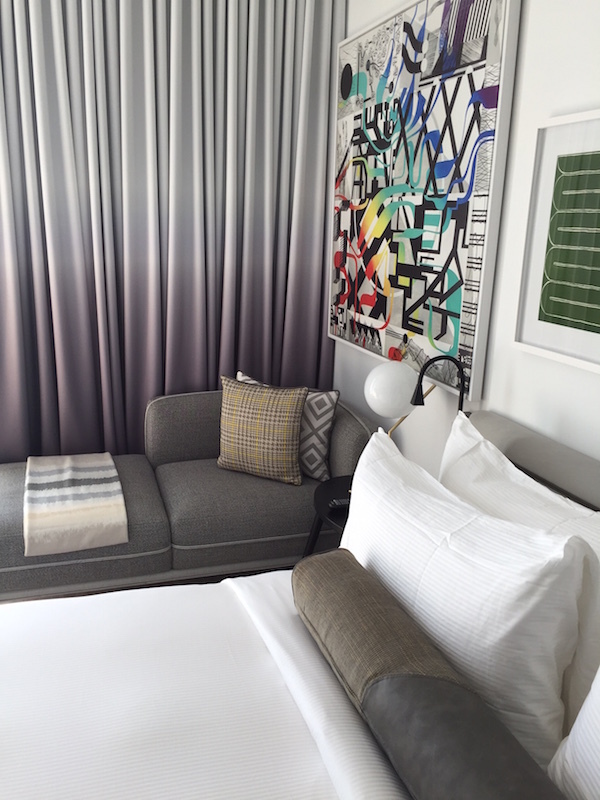 Finding a decent NYC hotel can be fraught for visitors. Real estate is so expensive that even budget hotels sport luxury price tags, and rooms are minuscule by other cities’ standards. 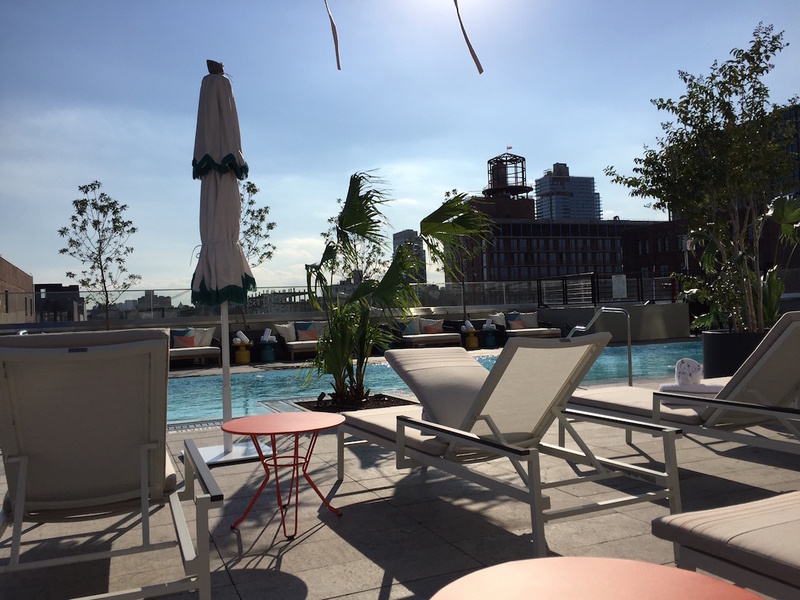 But if you stay in hip Williamsburg, Brooklyn at The William Vale Hotel, you can get more bang for your buck, and discover a new neighborhood, too. You can also more easily park, though you might take the train, ferry, Uber, or even bicycles to tour the city. Williamsburg, Brooklyn, has nearly reached a saturation point in farm to table restaurants, craft cocktail bars, and fashionable boutiques. It has finally added hotels to the landscape, often for the out-of-town parents of the owners and patrons of those establishments. 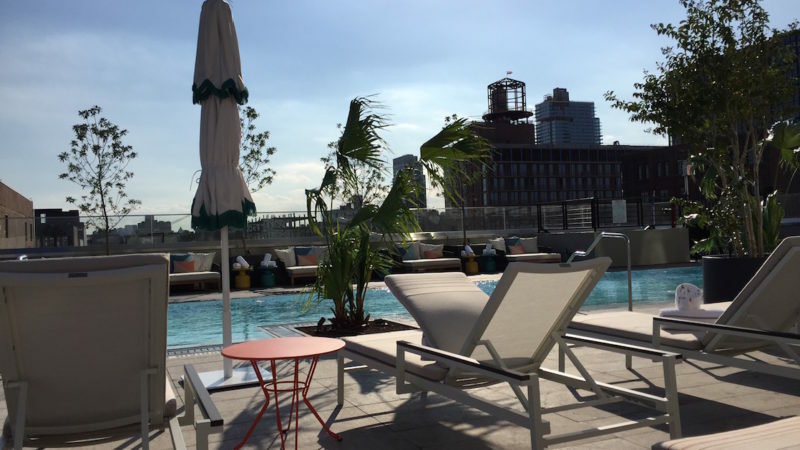 The William Vale Hotel fits right into the scene, with a gorgeous rooftop bar and restaurant, killer Manhattan views from guest rooms with floor to ceiling windows, and a gigantic outdoor pool. This is an ideal place to lay your head when traveling with tweens or teens. The open balconies would give me pause with young children, who are often immune to Williamsburg’s grittier charms. But older kids, particularly those into fashion, music, and alternative theater, may think they have found a home (why not look at NYU’s Tisch School of the Arts or Pratt Institute while you’re here?). Perhaps a bit cliche, but looking for a cool NYC hotel location? The William Vale is around the corner from two of Williamsburg‘s most popular places. The Brooklyn Bowl is a hipster-ish bowling alley / restaurant that also hosts great live music events. A few feet further is the Brooklyn Brewery headquarters, a craft beer brewery that you can tour. Kids can go on the brewery tour with their parents. Throw an Etsy-purchased, handmade hat and you’ll hit a great bar or restaurant. The Tuscan inspired Aurora, a couple of blocks away, has a huge garden that transports you to Italy, plus lovely classics like vegetarian risotto balls, a peach and arugula salad (that I left the pork out of), and ravioli filled with burrata cheese and topped with chanterelles and truffle ragú. Walk over to Bedford Avenue, the main retail street, or to the waterfront, where the food festival Smorgasburg originated. All the food at the hotel is by local chef Andrew Carmellini. Leuca, the ground floor Southern Italian restaurant, will serve breakfast, lunch, and dinner when it opens in November. 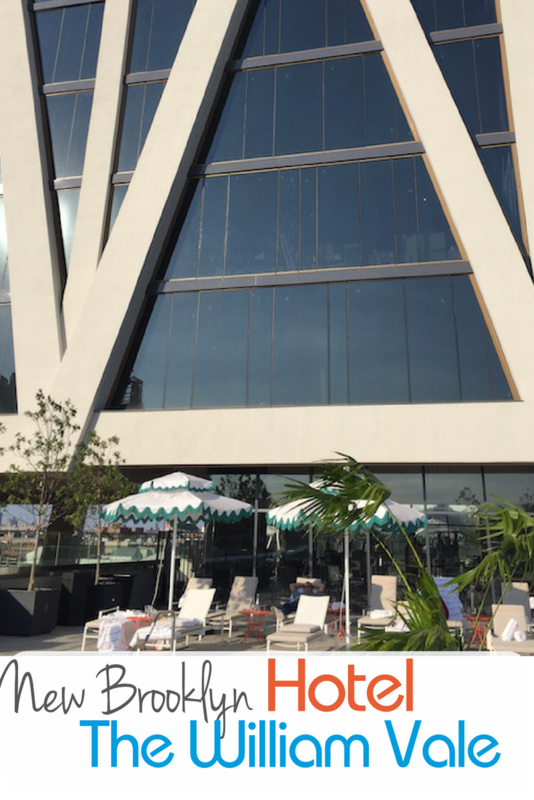 Westlight, the rooftop bar, has ‘high’ quality snacks like vegetarian eggplant dumplings, hummus with naan, and a sweet pea and kale spring roll. NYC hotels are not noted for their expansiveness, but my king-sized room had a super comfortable king bed, with Frette linens, a fainting couch, and a balcony with a couple of bistro chairs and a table. Since the windows were floor to ceiling, black out shades ensured a good night’s sleep. 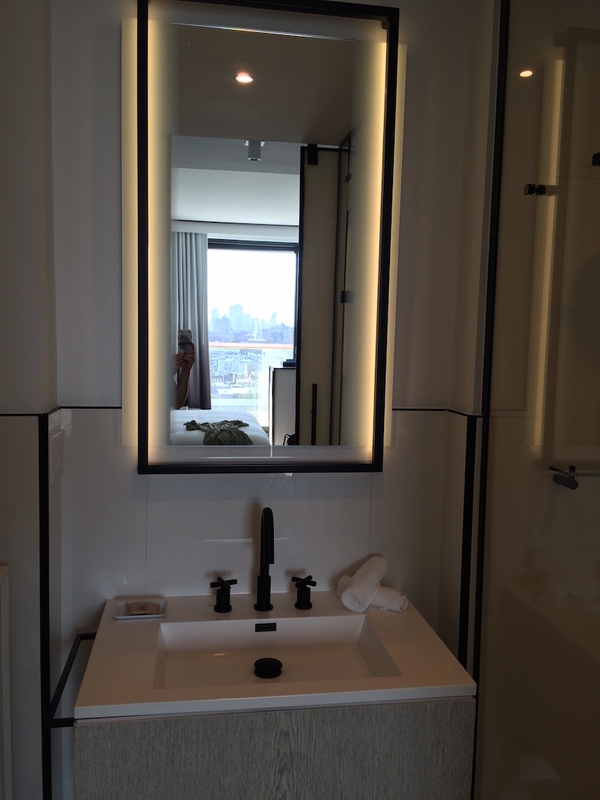 The bathroom, separated from the room by frosted glass, had a rain shower and luxury bath products by L’Occitane. Towels were soft and fluffy. The pool is an incredible perk. Sixty feet long, it has couches, lounges, and a bar surrounding it. You can get a Tiki drink and transport yourself to the Caribbean, or indulge in your surroundings with a local craft beer. 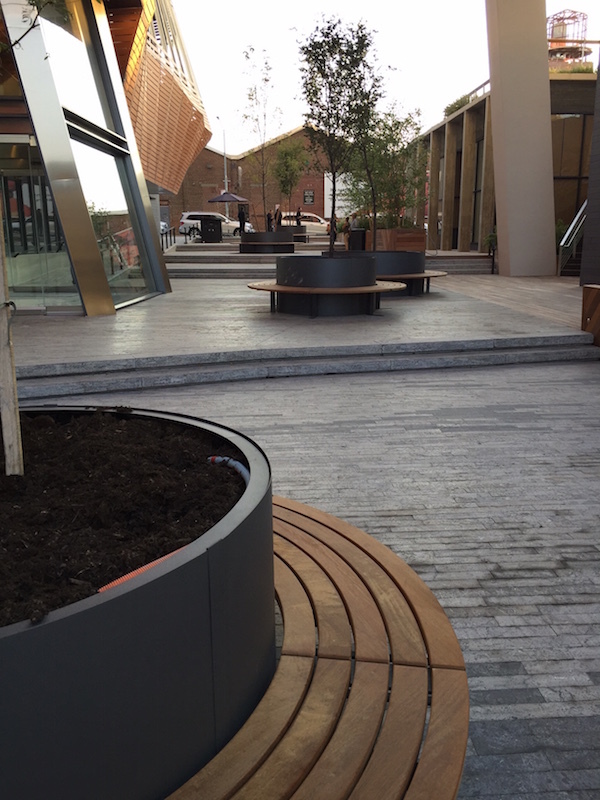 The adjacent landscaped Vale Terrace is an open-air event space that hosts live shows. 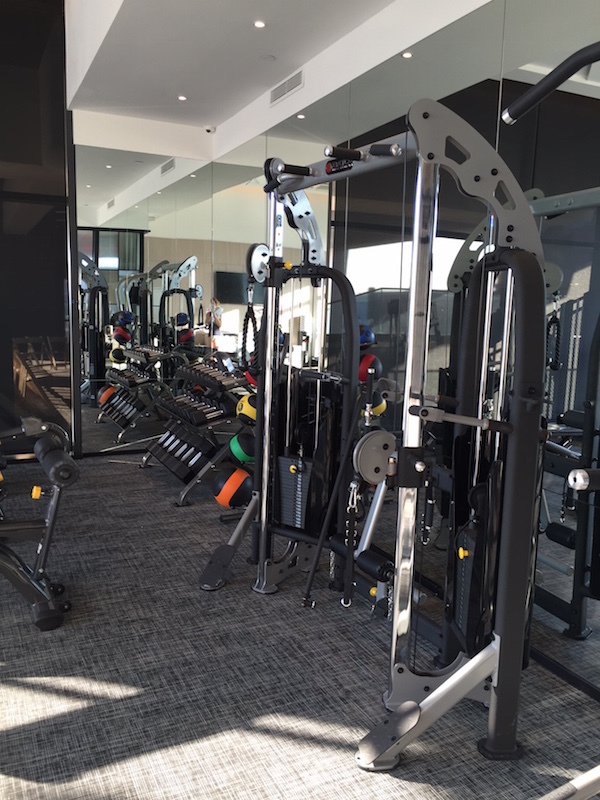 There is also a large gym, with state-of-the-art exercise equipment and a view of the pool. If you want to bring your workout outside, steps away is a CitiBike kiosk and bike lanes crisscross Brooklyn. Along Kent Avenue, there is a protected bike lane on the water, and you can ride to Red Hook or Long Island City with very few traffic interruptions. This is also a great place for a long run. The hotel has a private elevated outdoor green space, Vale Park, where you can hang out and congratulate yourself for staying at such a cool place; there is also a nice public plaza outside the hotel. Note: I was a guest of Smart Car at The William Vale Hotel and my room rate was covered. Opinions expressed are my own.